are used to center, as much as possible, the bubble of the bull's-eye level. The line of sight automatically becomes horizontal and remains horizontal as long as the bubble remains approximately centered. The hand level, like all surveying levels, is an instrument that combines a level vial and a sighting device. Figure 5-4 shows the Locke level, a type of hand level. A horizontal line, called an index line, is provided in the sight tube as a reference line. The level vial is mounted atop a slot in the sighting tube in which a reflector is set at a 45° angle. This permits the observer, who is sighting through the tube, to see the object, the position of the level bubble in the vial, and the index line at the same time. To get the correct sighting through the tube, you should stand straight, using the height of your eye (if known) above the ground to find the target. When your eye height is not known, you can find it by sighting the rod at eye height in front of your body. Since the distances over which you sight a hand level are rather short, no magnification is provided in the tube. Figure 5-4. - Locke level. After you select the proper location for the level, your first step is to set up the tripod. 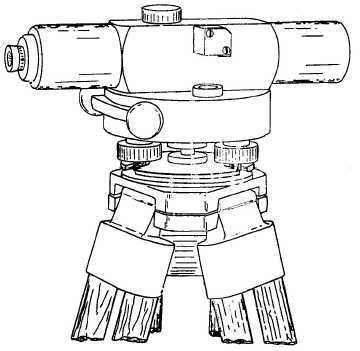 This is done by spreading two of the legs a convenient distance apart and then bringing the third leg to a position that will bring the protector cap (which covers the tripod head threads) about level when the tripod stands on all three legs. Then, unscrew the protector cap, which exposes the threaded head, and place it in the carrying case where it will not get lost or dirty. The tripod protective cap should be in place when the tripod is not being used. Figure 5-3. - Self-leveling level.